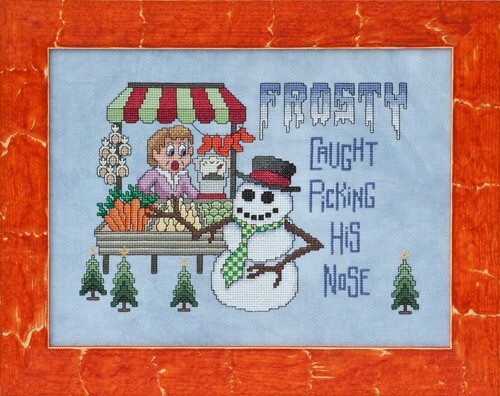 position as he is literally “caught picking his nose”. Fabric: Stitched on 28ct “Dwarf” Cashel Linen by Picture This Plus. Design Area: 9-5/8″w X 6-7/8″h. Fibers: Uses a total of 43 colors of Sullivans floss. DMC and Anchor comparable colors are also provided. Design has a good amount of 1/4 stitches, and therefore it is not recommended that you stitch this design on Aida fabric.